Small update today. I mocked up some Infinity results slips for use in the 2016 ITS format and thought I'd take the opportunity to share them with other organisers. The slips fit six to an A4 page and you can download the PDF from my Google Drive here: Result slips download. If you are running a tournament for the first time then do also check out my article for advice on organising a successful event. 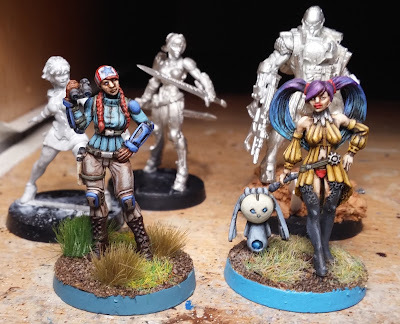 There's one aspect of Infinity that has always struck me as poorly documented and that is the limited edition miniatures that were released over the last five years or so. I've seen many discussions about them and read lots of requests for information but I've yet to see anyone attempt to catalogue all those that have been available. So I'm going to step in and try and set things straight! Frankly, I'm a sucker for this kind of thing so it's definitely my forte - I just can't help buying into whatever rare toys are made available! The Limited Edition miniatures can be broken down into four broad categories; tournament rewards, pre-order bonuses, celebrations and 'others'. Please note that this does not include anything from the general Bootleg range (such as Penthesilea), out of production/unreleased miniatures or the starter-pack exclusives, but do let me know if you think I've missed any!